The debt ratio shows your long-term and short-term debt as a percentage of your total assets. The lower your debt-ratio, the better your chances are of qualifying for a mortgage. Simply put, the debt ratio compares your total debt to total assets. Your debt includes recurring monthly payments that you owe, such as credit card bills, loans, and mortgage. Your total monthly pre-tax income (salary, wages, tips, child support, social security, etc.) amounts to your assets. The percentage that results from dividing your debt by assets is the debt-to income ratio. When it comes to mortgages, the debt-to-income ratio is a big factor for lenders when considering to grant you a loan. Your credit score may be high, and that may show that you are able to make payments on time. 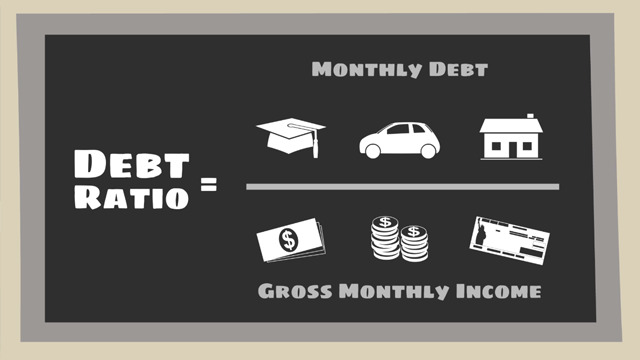 Having a high debt ratio, however, means that you’re cutting it very close. This makes a lender worry that even though you’ve been making your payments regularly, that may not always be the case. In most cases, the highest debt-to-income ratio acceptable to qualify for a mortgage is 43%, although many larger lenders may look past that figure.